I worked as Co-UX Designer on this project and my role involved design ideation, user research, sketching, prototyping, visual design and communication of the ideas. 1: Two broad users; symmetrical information. 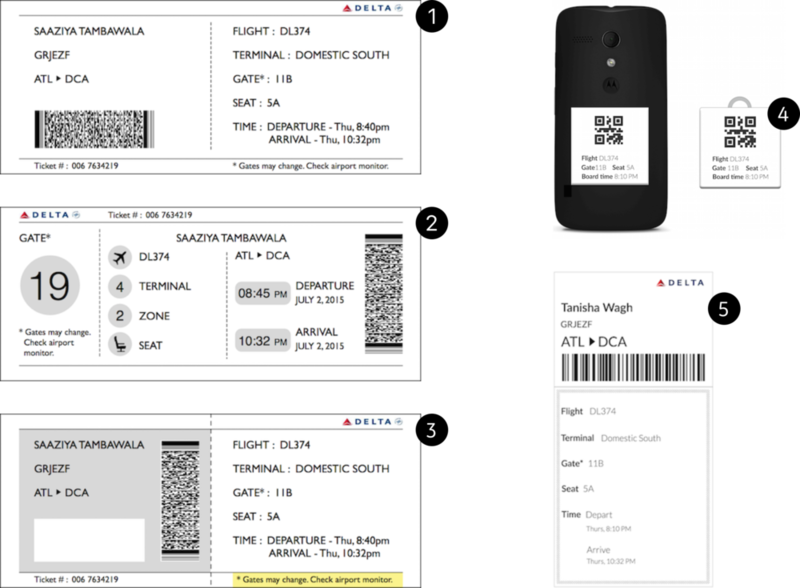 2: Combines iconography and short text to support Sonam (first-time flyer) and Dr. Daniel's (flyer with disability) use cases. 3: Color variation with sectioning by user type. 4: Keychain/peel-off sticker for convenience and placement. 5: Bookmark for alternate use. 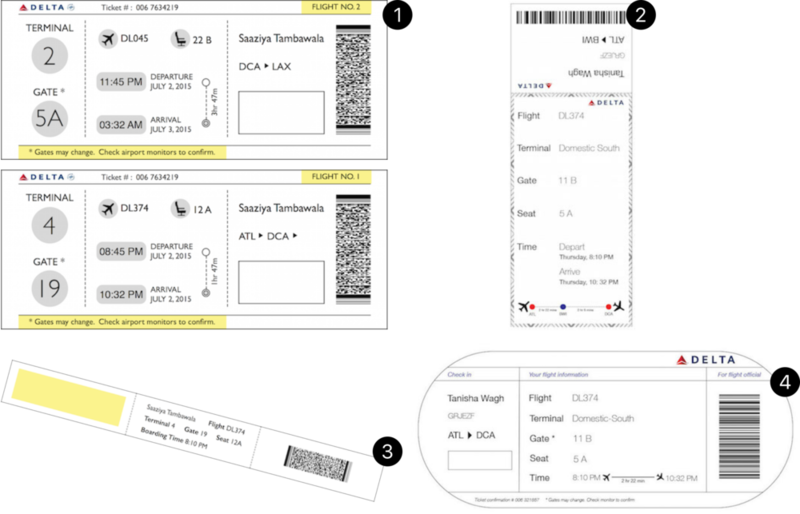 1: Improvised previous design 2 with double-sided ticket for connecting flights. 2: Changed the direction of layout to increase efficiency; included more visual elements for alternate use. 3: Armband for frequent flyers; this reduces need for any additional device. 4: Making the sectioning by user type more parallel and standardizing the language hierarchy. 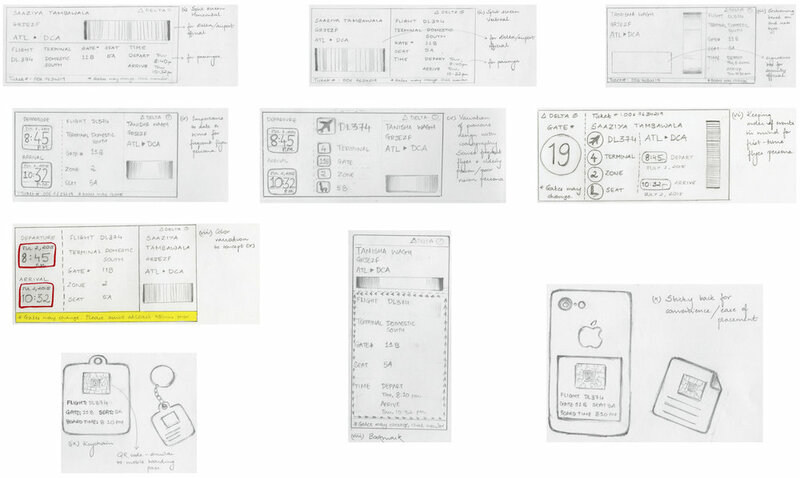 After two rounds of in-class critiques, we sought to streamline our existing designs into one or two final, refined concepts. We compared designs horizontally, which means we evaluated the design process for a single artifact and only gave thought to how could this individual piece be better. How to raise the voice of branding, and make the airline identity apparent? Is the design really viable? If so, how can we trim the design cost even more? Ultimately we chose to pursue the bookmark idea with care to providing authority/veracity to the display of information. We did this by demarcating a separate shape and color to the flight related information while also keeping purely visual elements, like the border, in tact so that the artifact could serve as a personalized souvenir.